Above: GOES-16 image of Tropical Storm Michael at 10:15 am EDT October 8, 2018. Image credit: NOAA/RAMMB. Michael is the 13th named storm and 7th hurricane of the 2018 Atlantic hurricane season. It is destined to become the fourth named storm to hit the U.S. this year, and most likely the strongest at landfall. The other three were Subtropical Storm Alberto (May 28 near Pensacola, FL), Category 1 Hurricane Florence (September 14 near Wrightsville Beach, NC), and Tropical Storm Gordon (September 4 near the MS/AL border). 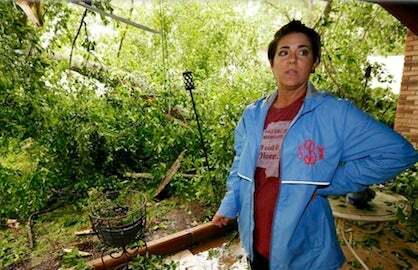 On average, the U.S. is hit by three named storms each year, with one of them being a hurricane. 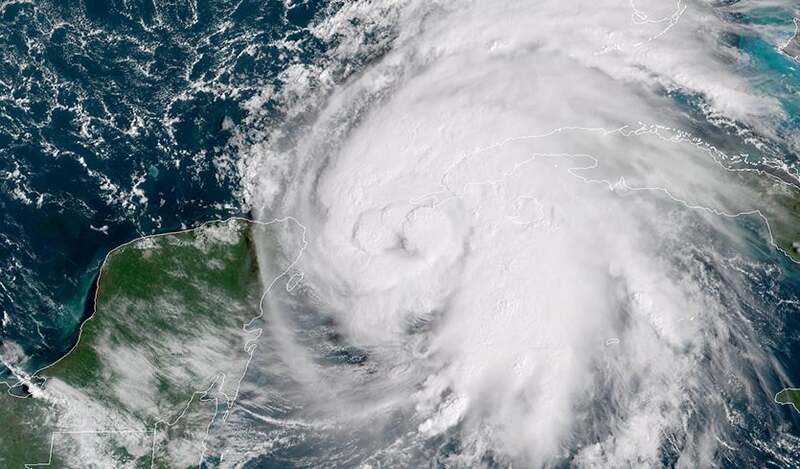 Satellite images on Monday morning showed that Michael had improved significantly in organization, with an impressive area of very heavy thunderstorms with cloud tops that were as cold as –80°C (–112°F). Cloud tops this cold can only occur if the updrafts pushing them upwards are very vigorous. Michael was beginning to close off an eye, and low-level spiral banding was improving. Michael was under a moderately high 15 - 20 knots of wind shear, due to strong upper-level winds out of the west from an upper-level trough of low pressure. The storm was embedded in a moist atmosphere with a mid-level relative humidity of 70%, and was over very warm waters of 29.5°C (85°F). These warm waters extended quite deep, and had an extremely high heat content. Figure 1. 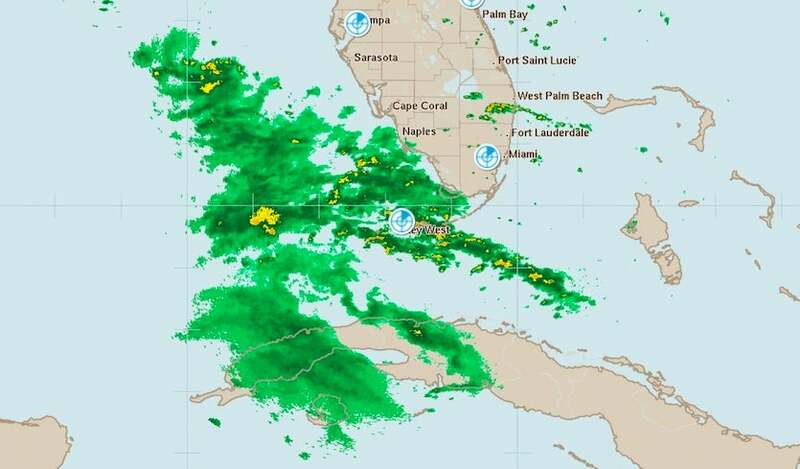 Radar image of Michael from the Key West radar at 10:05 am EDT October 8, 2018. Michael was bringing heavy rains to the Florida Keys and western Cuba, as seen on Cuban radar. NHC was calling for storm-total rainfall amounts of 4 – 8” over western Cuba, with isolated totals of 12”. Rainfall amounts of 2 – 4” were predicted for the Florida Keys and 1 -2” for Mexico’s Yucatan Peninsula. Figure 2. Left: The 0Z Monday, October 8, 2018 track forecast by the operational European model for Michael (red line, adjusted by CFAN using a proprietary technique that accounts for storm movement since the time of the advisory), along with the track of the average of the 50 members of the European model ensemble (heavy black line), and the track forecasts from the “high probability cluster” (grey lines)—the five European model ensemble members that have performed best with Michael thus far. Right: Track forecasts for Michael from the 0Z Monday, October 8, 2018 run of the GFS model. The forecasts agree on a Florida Panhandle landfall, then a curve to the northeast. Image credit: CFAN. The track solutions for the central Gulf Coast from our top models are closer than usual for a prediction some two days out. The NHC’s “cone of uncertainty,” which will appear when watches are issued for Michael, is based on the typical track error from the past five years of forecasts. In this case, there appears to be less discrepancy among models than usual for Michael’s track, which lends higher-than-usual confidence to the track forecast. The GFS, European, and UKMET models all have consistently predicted Michael to make landfall over the western Florida panhandle, and this is reflected in the ensemble tracks shown in Figure 2 above. Michael’s greatest landfall impacts will be near and to the east of the center, mainly the Florida Panhandle coast. Residents along the Mississippi and Alabama coasts, and inland for some distance over the Florida Panhandle and southern Alabama and Georgia, should be prepared for at least tropical-storm force winds, which can bring down trees and power lines. 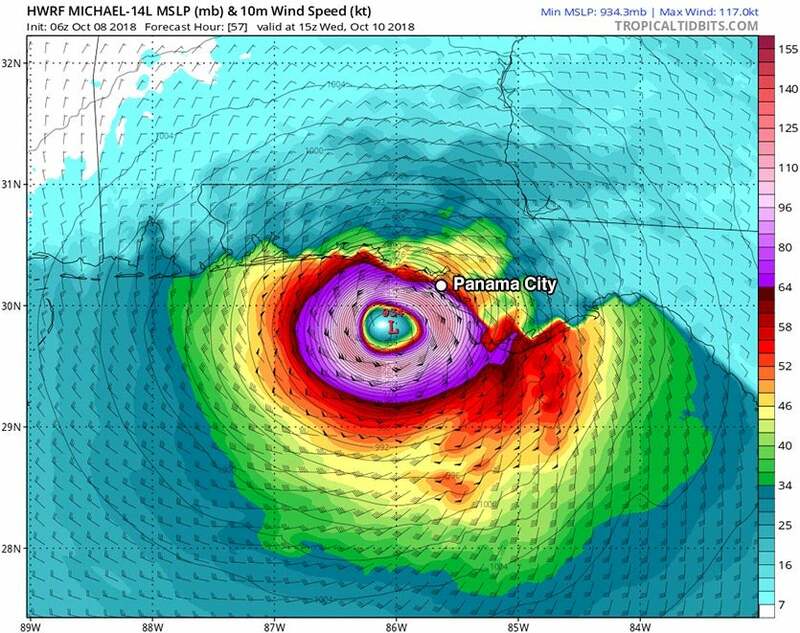 Timing remains a big uncertainty for Michael’s landfall. The official NHC forecast as of 11 am EDT Wednesday brought Michael to the coast of the western Florida by late Wednesday morning. However, model projections for Michael's landfall have ranged from as early as Wednesday morning (as indicated by the GFS model) to as late as Wednesday night (as indicated by the European model). With this in mind, residents should allow an extra margin of error for the possibility that Michael could arrive on the early side Wednesday. The more slowly Michael moves, the more likely it will track further east, so the uncertainty in Michael's track grows considerably larger with time after landfall. The 0Z Monday operational run of the European model brings Michael near the coast of South Carolina early Friday and tracks it northeastward along or near the Carolina coasts to the Outer Banks on Friday, a prospect that could bring heavy rain and widespread tropical-storm-force winds to the areas hard hit by Florence. The GFS model takes Michael considerably further to the west—across northern Georgia on Wednesday night and to the Delmarva by Thursday night. In this case, the swath of heaviest rain accompanying Michael would affect mainly the southern Appalachians, and Michael could be expected to decay more quickly. NHC’s track forecasts, which take all models into account, tend to be more accurate than the results from any particular model. It is likely—but not guaranteed—that Michael will track somewhere between these leftward and rightward solutions. Because steering currents will keep Michael moving along, rainfall amounts will be considerably less than those that occurred during slow-moving Hurricane Florence. Very heavy rains and localized flooding will still be possible. Figure 4. Predicted surface winds (colors) and sea level pressure (black lines) for 11 am EDT Wednesday, October 10, 2018, from the 6Z Monday run of the HWRF model. 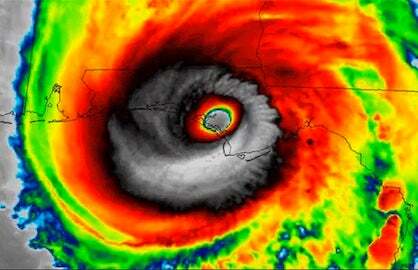 The model predicted that Michael would make landfall as a Category 4 hurricane with 135 mph winds near Panama City, FL. Image credit: Levi Cowan, tropicaltidbits.com. The official NHC intensity forecast at 11 am EDT Monday called for Michael to be a mid-strength Category 3 hurricane with 120 mph Tuesday night through Wednesday morning. The 6Z Monday run of our top intensity model from 2017, the HWRF model, predicted landfall on Wednesday morning as a Category 4 hurricane with 135 mph winds. The 6Z Monday run of the HMON model predicted landfall as a Category 3 hurricane with 120 mph winds. Our other two top intensity models, the DSHIPS and LGEM, were more restrained, predicting that Michael would make landfall as a Category 2 hurricane with 100 mph winds. Given the uncertainties in intensity forecasts, we should expect at least a 30% chance that Michael will be a Category 4 at landfall. 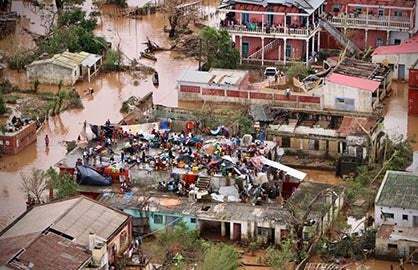 Landfalling Category 4 hurricanes are rare in the mainland U.S., with just 24 such landfalls since 1851—an average of one every seven years. (Category 5 landfalls are rarer still, with just three on record). The main impediment to intensification for Michael will be wind shear. An upper-level trough of low pressure was bringing 15 - 20 knots of shear to Michael Monday morning. This trough is forecast to weaken to pull to the west, allowing shear to drop to 10 – 15 knots Tuesday through Wednesday. We’ve already seen Michael rapidly intensify by 40 mph in the 24 hours ending at 11 am EDT Monday, so we should not be surprised if the storm shows at least steady strengthening over the next two days, and perhaps rapid intensification at times. The 12Z Monday run of the SHIPS model gave a 55% chance that Michael would continue to rapidly intensify (a 30 mph increase in winds in 24 hours), and 27% chance it would become a high-end Category 3 hurricane with 125 mph winds by Tuesday night. This is the model NHC uses operationally to forecast rapid intensification. 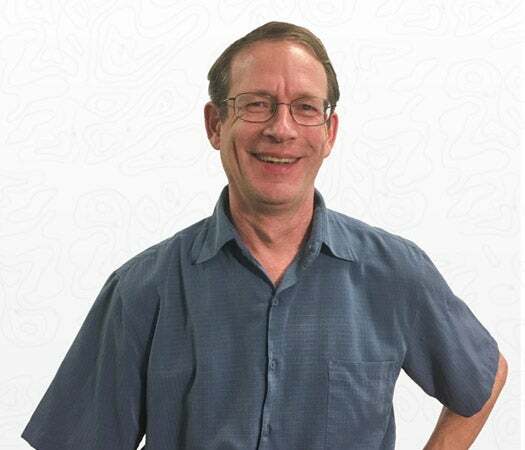 There is a new experimental Deterministic to Probabilistic Statistical Model (DTOPS) model that NHC started evaluating last year to make forecasts of rapid strengthening. DTOPS uses intensity forecasts from the European, GFS, HWRF, LGEM, and SHIPS models to compute a probability of rapid intensification. According to a paper presented at this year’s AMS hurricane conference, DTOPS performed similarly or better than the operationally used SHIPS rapid intensification model. The 12Z Monday run of DTOPS gave a 52% chance that Michael would intensify into a 125 mph Category 3 hurricane by Tuesday night, and a 32% chance of becoming a Category 4 hurricane with 140 mph winds by Wednesday morning. As we saw with Hurricane Florence, rapid-intensity forecasting is difficult to do correctly. At 12Z September 4, Florence began a rapid intensification phase that brought it from a low-end Category 1 hurricane with 75 mph winds to a Category 4 storm with 130 mph winds in less than 36 hours. The SHIPS and DTOPS models predicted a 10% and 0% chance of that happening, respectively, with their 12Z September 4 forecasts. Sea surface temperatures (SSTs) are between 29 - 30°C (84 - 86°F) across the northwest Caribbean and eastern Gulf, which is 1 - 2°C (2 - 4°F) above average for this time of year. Michael is predicted to pass over a cool eddy with low heat content on Monday night after it passes through the Yucatan Channel between Cuba and the Yucatan Peninsula. But on Tuesday, Michael’s center will pass just to the east of a warm Loop Current eddy with high heat content, and if the system is well organized when it passes over the warm eddy, rapid intensification is possible. Even though it is early October, no cold fronts have yet chilled the waters near the central Gulf Coast, so very warm surface waters are in place to support Michael right up to landfall. Bottom line: expect Michael to be a Category 2 or 3 hurricane at landfall, but we can’t rule out a Category 4 landfall. A Storm Surge Watch is up for much of Florida's Gulf Coast, from Tampa Bay northwestward to Fort Walton Beach. Persistent onshore winds had already created a storm surge of around 1 – 2 feet along much of the Gulf Coast from Southeast Louisiana to the Florida Panhandle on Monday morning, as seen using our wundermap with the “Storm Surge” layer turned on. There are very shallow waters along the coast where Michael is expected to make landfall, where the continental shelf extends out about 70 – 90 miles from shore. 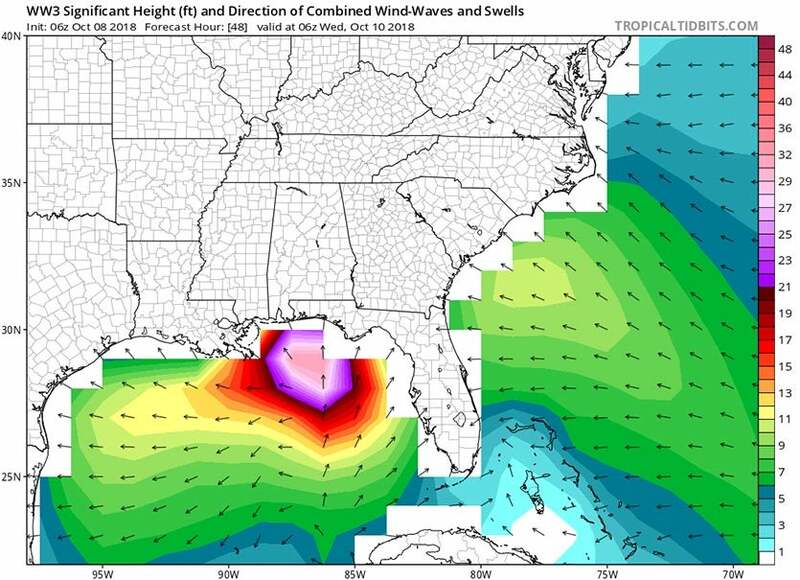 The winds from the storm will thus be able to pile up a large storm surge along the east side of the storm’s center. When this surge rides ashore at landfall, the water may reach heights of 8 - 12 feet in Florida’s Apalachee Bay, between the Florida Panhandle and the southward-jutting Florida Peninsula, since the concave-shaped coast there acts to concentrate storm surge. When Category 3 Hurricane Dennis made landfall in the western Florida Panhandle near Santa Rosa Island in July 10, 2005, it brought a storm surge of 6 - 9 feet to Apalachee Bay, which lay 170 miles east of Dennis’s landfall location. The surge inundated parts of the town of St. Marks and other nearby areas. A storm surge of 4 - 6 ft occurred elsewhere in the Florida Panhandle.